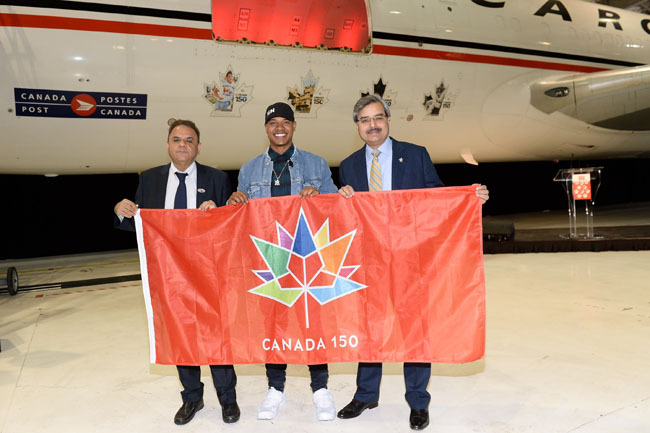 Mississauga, ONT – Cargojet and Canada Post together with ace Blue Jays pitcher Marcus Stroman marked Canada’s 150th birthday celebration by launching 10 unforgettable moments in Canada’s last 50 years on a Cargojet Boeing 767-300AF. The event took place in Hamilton at the Cargojet Hangar facility. These stamps celebrate this very special year in our countries’ history. They are stories of courage, compassion, innovation and diversity. The very values our nation was built on, that make us who we are today. "To celebrate Canada 150, Canada Post has showcased 10 unforgettable moments from the past 50 years through our iconic national stamp program," said Deepak Chopra, President & CEO, Canada Post. "We’re excited to team up with Cargojet to share these stamps, and the incredible stories behind them, with as many Canadians as possible. "Playing and living in Canada has allowed me to experience what a great nation Canada is. I am honoured to be part of Canada’s 150th celebrations with two great Canadian companies Cargojet and Canada Post," said ace pitcher Marcus Stroman. "Cargojet is very excited to partner with Canada Post on celebrating Canada’s 150th milestone. We are thrilled to be honouring our nation’s birthday and will be proudly displaying these stamp images on our aircraft," says Dr. Ajay K. Virmani, President & CEO. "These images are representative of Canada’s diverse culture and history and we are proud to participate in this celebration," he added. Cargojet is Canada’s leading provider of time sensitive overnight air cargo services and carries over 1,300,000 pounds of cargo each business night. Cargojet operates its network across North America each business night, utilizing a fleet of all-cargo aircraft.